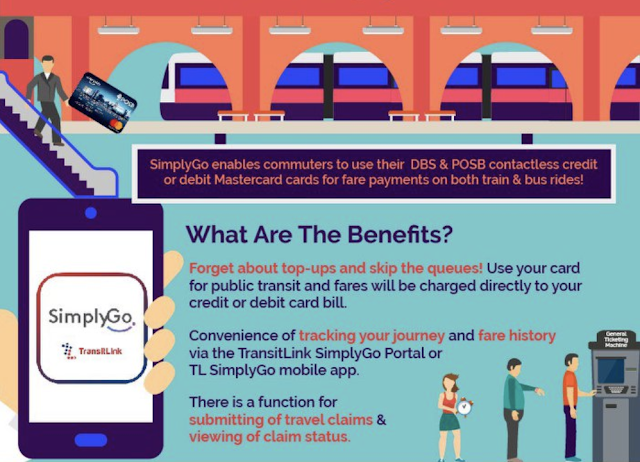 SG Budget Babe: SimplyGo for public transport - Should You Switch? SimplyGo for public transport - Should You Switch? Now you can get cashback / miles on your public transport expenses. Given how much we spend on public transport each month, it makes sense to ensure you're getting rewards for that - whether in the form of miles or cashback. I've previously written about how I use the Citi SMRT Card for this purpose, which rewards me with 2% SMRT$ on every EZ-Reload top-up (of >$30 each time) as long as I spend at least $300 on other retail purchases as well. The top-ups are done automatically for me too, so it has always been the most convenient method to earn cashback on my public transport expenses. LTA has been piloting a contactless initiative with the various payment providers (Mastercard, Visa, NETS, etc) since 2017 via the Account-Based Ticketing (ABT) System. This service would allow you to charge your public transport expenses to your credit card and earn rewards for it, and has now been rolled out islandwide on Mastercard. Why is this so game-changing? Because credit card companies do not traditionally give rewards for ez-link transactions otherwise - a point I've repeatedly highlighted in the (free) Ultimate Guidebook to the Best Cashback Tools in Singapore. But now with SimplyGo, you can start earning cashback or miles on your public transport expenses. Do you know what that means? In other words, FREE MONEY for something you're already spending on! Should I switch to SimplyGo? Visa payment mode is not available via SimplyGo yet, but LTA has said they're expecting Visa to come onboard later this year. Come on, Visa! There are also no transaction fees for this service, just in case you were wondering. Yay! Unfortunately, students and senior citizens on concession passes are not covered under this service for now, although LTA hasn't ruled out including this in the future. Reminder: avoid duplicate fare charges by taking your ez-link out of your wallet if you're using your credit card. 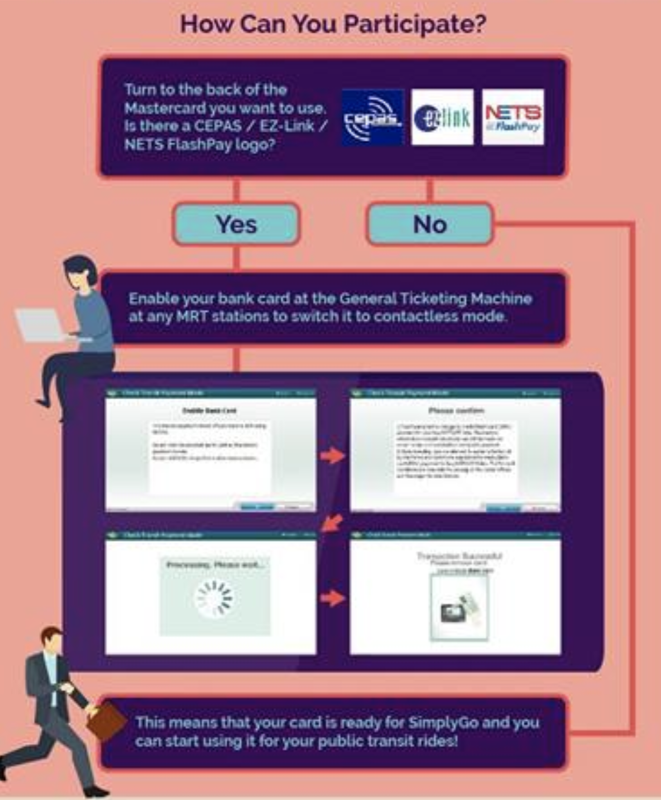 Simply head to any ticketing machine at a MRT station or bus interchange to activate this service. Almost every credit card will automatically deduct your fare via CEPAS (which doesn't give you cashback/miles), so you need to switch payment mode to bank card (select the "Check Transit Payment Mode" option) on the machine. You'll know it's successful when you pay and the green screen on the station gate says "Bank Card Usage". You do not need a SimplyGo account to start using this service, but if you wish to track your ride fares and more, you can sign up here at www.simplygo.transitlink.com.sg. There are several promotions in the market now to take advantage of if you've decided to switch, and you can view the full list from Transit Link here. If you're among the first 10,000 registrants to switch your OCBC / UOB / Standard Chartered Mastercards, you can also get a $10 - $15 rebate (first 5k for SCB cardholders). The best promo would be the 50% offer on Citi credit cards, but I could not verify this at all on the Citibank website. 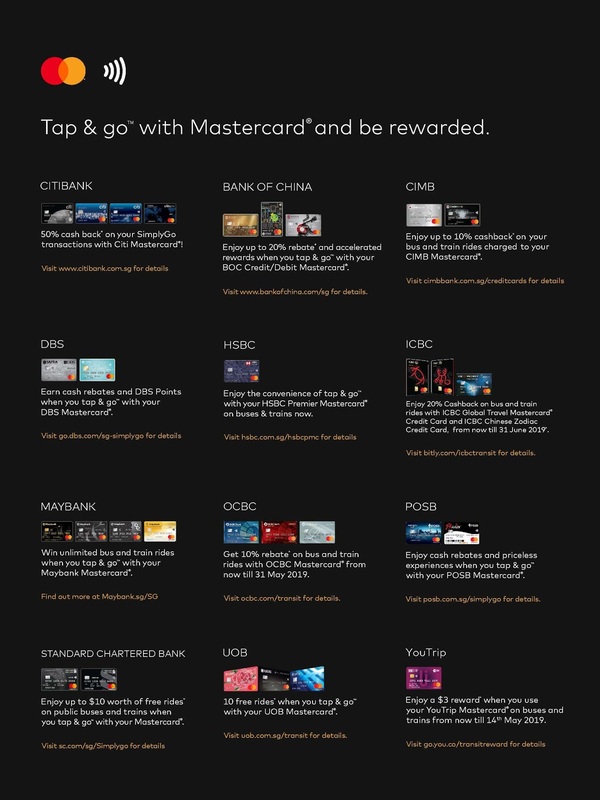 The next best seems to be on ICBC Global Travel Mastercard and Chinese Zodiac credit card, which offers up to $20 cashback from now till end June 2019. Another great card I love in this list would be the CIMB Mastercard, which I've had since last year and used it for the 10% rebate on my hospital delivery bill. Even if your card is not in this list, it'll be worth switching over so you can finally now earn some cashback / miles on your public transport. I can only hope the credit card companies don't change this T&C soon. In the meantime, thanks LTA for making this happen!